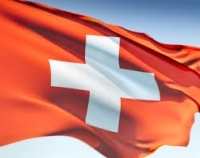 The Swiss franc, a currency that has provided refuge for investors since the escalation of the euro zone debt crisis, may be the next safe haven to fall, according to a new report from Societe Generale. The bank forecasts the Swiss franc could weaken by almost 10 percent against the euro by mid-2014 to 1.35, as systemic risk in the single currency bloc recedes. One euro currently buys 1.229 Swiss francs. "Systemic risk has faded in the euro zone, and further progress will be made to tackle the solvency issues of euro zone countries, the Swiss franc should lose its appeal as an alternative investment," the bank said. Further cooperation among European leaders, including fast tracking a banking union, for example, and an improvement in the region's growth prospects would be negative for the currency, it noted. Recent economic indicators including the latest euro zone Purchasing Manager's Index (PMI) - which rose to a near two-year high in July - suggest a possible turning point for the euro area. "Moreover, the economic recovery in the US and higher global yields will see capital flowing out of safe havens into higher beta and higher yielding assets," it added. However, there is a risk that the Swiss National Bank may hike rates next year to counter housing inflation, the bank said, which could limit the currency's downside. Switzerland has seen a surge in property prices following the 2008 global financial crisis, driven by ultra-low interest rates. Senior Callow, senior currency strategist at Westpac, says while he can see the case for a weaker Swiss franc, it may be too early to bet against the currency. The bank expects demand for the safe haven currency to remain intact over the next 12 months. "It really comes down to your view on the strength of the euro and whether you think the sovereign risk debt crisis is largely behind us. Next year, we expect another full year of recession in the euro zone, against consensus," Callow said. "There are still several potential flash points that we suspect will return over the year ahead," he said citing the ongoing sovereign debt woes in Greece and Cyprus. Last week, for example, the troika said while Cyprus is complying with the conditions of its bailout program, risks remain substantial given uncertainty over its economic outlook. Westpac forecasts the euro-Swiss franc pair will be around the 1.21 level mid-next year, slightly stronger than current levels.